The Barcode Maker program generates 18 different barcode standards covering all current barcode needs in seconds. No need to learn : enter your product code, press 'Process' and voila ! The EAN13 Match™ font and Barcode Wizard™ are the easiest to use, most precise tools to produce reliable bar codes from your PC and laser printer, or from a typesetting equipment. This package suits the largest variety of printers and configurations, as well as typesetting and printing equipment. Download the free Windows evaluation sample installer, including the Barcode Wizard™ and the TrueType and ATM Type 1 EAN13 Match™ fonts. It works exactly like the full product, except the font does not print all numbers (1 and 6 missing), but it can be used for test scans with codes that do not contain them. At the end of download, simply click on "Open" to install. EAN-13 is the standard for bar code products in Europe and Japan (JAN-13). To print EAN-13 bar codes that will scan fine with all systems, you need the most precise bar code EAN-13 font, and just as importantly, a system that will compute for you which characters to use. This is, plain and simple, what this package is all about. Install the program, and that's it ! The Barcode Wizard™ takes out of creating bar codes all the cruel calculus usually needed for bar code fonts. 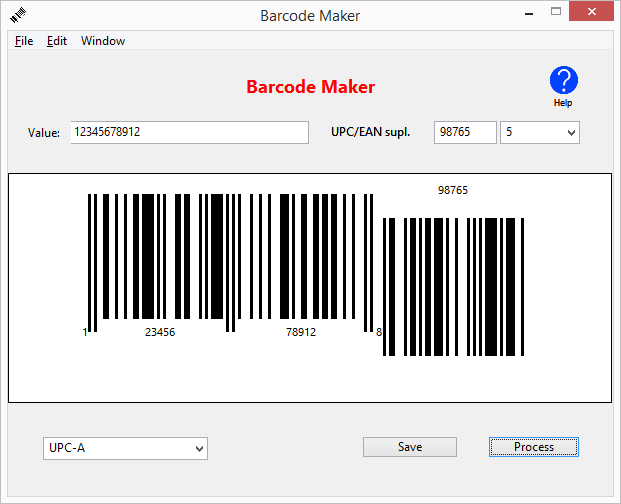 All you need to know is the product code ; the program will automatically generate the intricate character chains needed to print scanable bar codes. That's it! In seconds, the Barcode Wizard™ has created automatically two important pieces of information: the barcode itself. It has been copied by the program into the clipboard, you can now paste into any standard program such as word processor, desktop publishing programs, Excel, Word, Access or any graphic program. All you got to do to paste the result in your favorite application is to use the Edit/Paste menu command, or the standard Control-V keyboard shortcut (in standard Windows programs). Save pictures of the bar code in vectorial Eps and Pdf at sizes 1500x1000 up to 7500x500, or Png at the same sizes, and resolution 72 up to 600 dpi. This simple to use, affordable package is not meant to introduce users to the beauties of rocket scientist EAN-13 parity check calculus, as some other packages out there seem to conduce. Our goal is rather, to provide a convenient tool for the business community. With a simple font and program, you can start producing scanable bar codes for your packaged products in minutes, and center your energies towards selling it, the very reason why bar codes are so widely used today. This package contains NO complicated VBA sources, NO intricate macros. 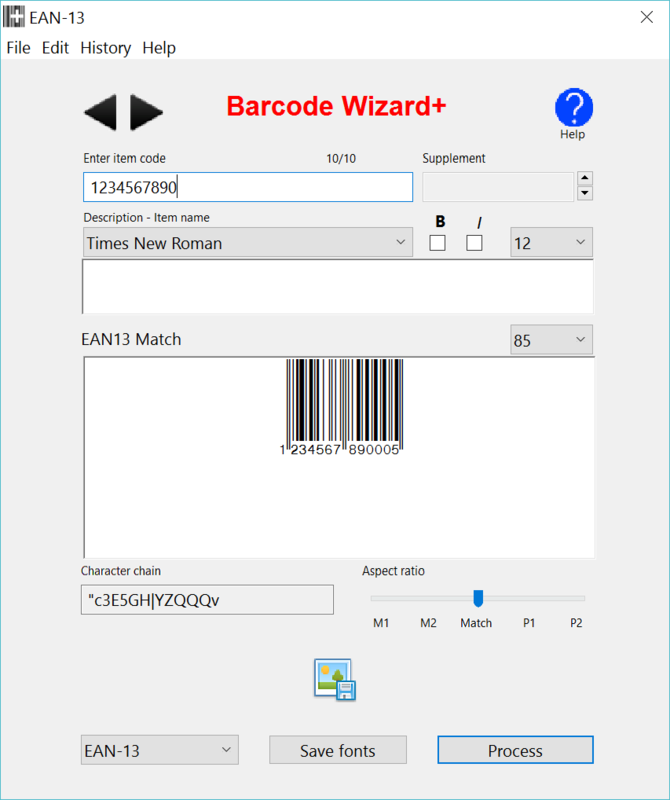 It is intended for use with the simple Barcode Wizard by end users, and is not meant for developers. Do you want to try this exclusive package before you buy ? Just download the free tryout package (see left). This is the ultimate money-back guarantee : try, test and use the product before you buy, get the feeling of it, and if you like it, the complete package is just a couple clicks away. Windows instant download $14.99 only. Mac OS X instant download $14.99 only. 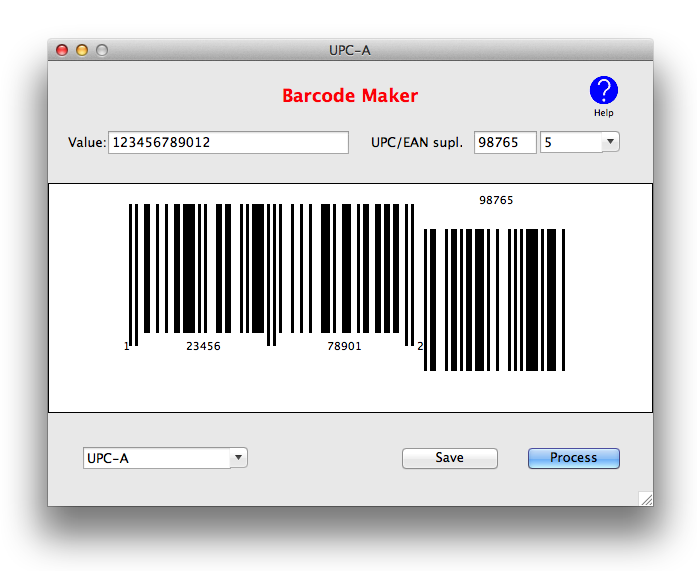 Barcode Maker/Marker is a simple to use program that generates 18 different barcode standards as graphics (no font), including the ubiquitous UPC-A, used in United States for cash register scan. You will be producing perfect bar codes in minutes. Enter the code, press 'Process', and the graphic appears on screen. It has also been copied into the clipboard, so all you have to do in most standard program is to paste it ! Voila ! 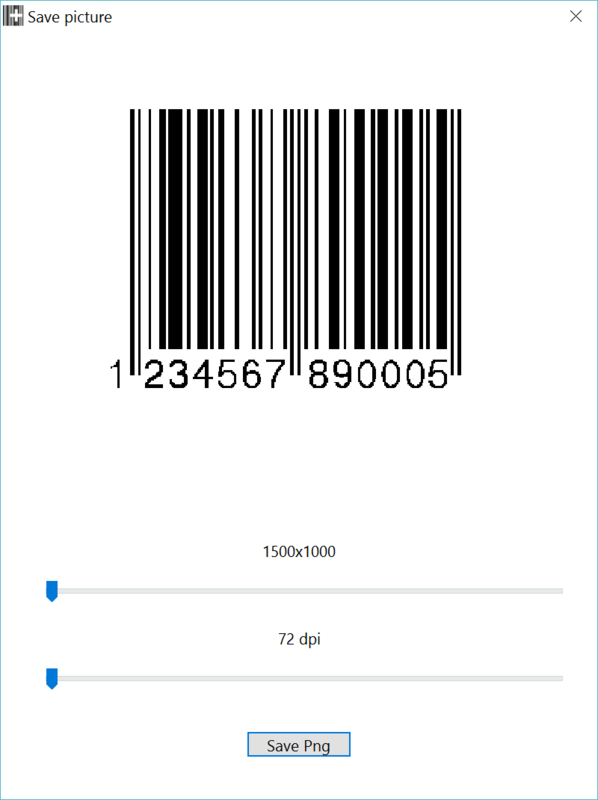 Barcode Maker/Marker is the simplest way to create bar codes. All you need to know is the product code ; the program will automatically generate scanable bar codes. That's it! In seconds, the program has created automatically a perfect barcode. It has been copied by the program into the clipboard, you can now paste into any standard program such as word processor, desktop publishing programs, Excel, Word, Access or any graphic program. All you got to do to paste the result in your favorite application is to use the Edit/Paste menu command, or the standard Control-V keyboard shortcut (Command-V with Mac OS X). Created bar code graphics can also be saved as pictures, for use in desktop publishing applications, or to rework in Photoshop, or other fine picture editing program. 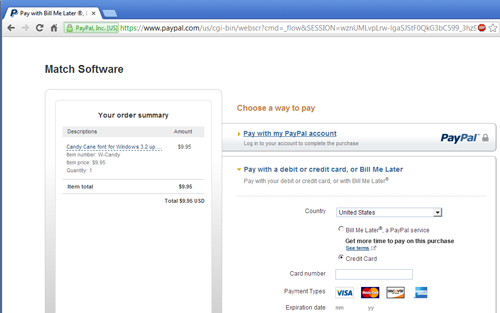 1 - When you click on the button "Buy & download", it takes you to a payment page. 2 - Immediately after you are finished paying, Paypal will confirm the transaction on screen, and an email will be sent to you with all details. After 10 seconds, your download starts. 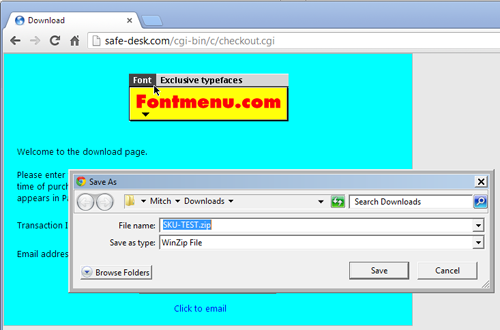 Fonts are delivered in a zip archive. Double click to open, then use the Windows Fonts control Panel or Mac OS X Font Book to install. That's it ! Fontmenu.com is another fine site from Match Software, the operator of BarcodeFontShop.com. Disclaimer : EAN13 Mtch™, Barcode Wizard™, are trademarks of BarcodeFontShop.com and its owners.